If you really enjoy old farm tractors, stop and stay awhile. Some of these links are really entertaining and all are informative. Moyer's Fuel Tank Renu This is my page. Moyer's Fuel Tank Renu will repair and restore any gasoline or diesel fuel tank regardless of age or condition. NO RUST lifetime nationwide warranty. Before and after pictures of a fuel tank sent to us from Texas. This is my favorite restoration. AMSOIL from Advanced-Synthetics.com Extend the life of your car, truck or boat with AMSOIL synthetic motor oils, lubricants and filtration systems. Omar Associates LLC Shop tools for classic farm tractors For more than twenty years our family has been operating and repairing International Harvester tractors. Based on our experience, we have engineered shop equipment that can make any restoration project fast and easy. Our rugged design and practical application make Omar's tools the best in the antique restoration business. POR-15 Shop-Paint Over Rust Por-15 is a moisture cured, high performance rust preventative coating that won't crack, chip or peel. High-Temperature coatings also available. Many uses for autos, home, marine and industry. Valu-Bilt Tractor Parts The Largest Selection of Tractor Parts in the U.S.A.
Rock Ridge Farm We have access to many hard to find parts for pre 1950 Tractors. The Harrolds at Home Welcome ... welcome to the website of Aubrey and Christine Harrold. Tractor-Radiators.com carries tractor radiators to fit the following manufacturers: Agco/Allis Chalmers, Case/ International Harvester, John Deere, Ford, Massey Ferguson, Oliver & White. Dennis Franz Don't miss the chance to become the owner of one of these hand made, running scale model tractors. If you are a serious collector and want to be the hit of any show, you'll definitely want to consider adding one of these treasures to your collection. These tractors are built exactly like the originals. What's New on The CJ3B Page: What's a CJ-3B Anyway? Adirondack Dodge Parts & Military Surplus We are your one source and world wide distributor of new, used and remanufactured parts for the indestructible Dodge M37 line of military vehicles. Also included in our inventory is line of military surplus, camping and survivalist gear. Pine Hollow Pottery Hand built pottery, porcelain vases, masks, plates, wall hangings and Holiday pieces. 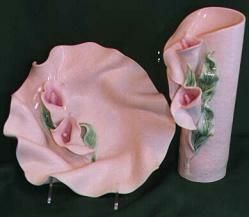 Unique porcelain handcrafted by Pennsylvania artists.